Nigerian forward Ndubisi Chukunyere enjoyed a successful career with Hibernians. When I interviewed Ndubisi Chukunyere way back in 2002 ahead of the European tie between Hibernians and Boavista, I was impressed with his humility and the spark of genius and intelligence in his eyes. Chukunyere was born on December 23, 1979 in Lagos. He comes from a big family of six brothers and one sister, none of whom apparently played football. Chukunyere received his education at Ijromi Ifelodun High School where he studied for his O Levels. It was here that he started to play football. Between the age of 11 and 12 he played regularly for the school’s first team. At the age of 13 he played in the Nigerian youth league with a local amateur team – Orkin FC. Two years later he moved to Soeness FC, a professional club that played in the Nigerian Second Division. At 16, he was already showing the skills which were to make him one of the most promising youngsters in Lagos. Chukunyere’s performances attracted the attention of the big Nigerian clubs and Kanopilas FC, one of the top Premier League teams, eventually signed him on loan. He stayed with Kanopilas for three months during which he played a number of friendly matches. The clubs, however, did not agree a transfer fee and he was forced to return to Soeness. Chukunyere was ambitious and eager to prove his worth in big-time football and in 1996, he decided as a first step to try his luck in Europe. Henry Ekezie, his representative in Malta, took him to Birkirkara but the Stripes failed to see his potential, something they would come to regret. Birkirkara’s loss proved to be Hibs’ gain. The Nigerian was introduced by Julian Holland to coach Mark Miller who was quick to recognise his obvious talents. Chukunyere was signed as a youth player but in December 1997 he broke into the first team and never looked back. Injuries hampered the Nigerian forward during the first part of his career but his great talent was never in doubt. To their credit, Hibs were patient and waited until Chukunyere overcame his fitness problems. They were rewarded when ‘Wo-Wo’, as Chukunyere was more popularly known, finally reached his potential. In 1996, Chukunyere was picked for the Nigerian Under-17 side for the World Championship qualifier against Congo. However, when the squad arrived in Congo, the team had problems with visas and the game was not played. Then, in 1998, Chukunyere was called up to the Under-21 squad, then in Ghana preparing for the junior World Cup. Chukunyere played against Zimbabwe (2-1), Ghana (0-0) and Ivory Coast (2-0). His goals against Zimbabwe and Ivory Coast assured him of a place in the squad for the finals. Disaster struck, however, when a few weeks before the finals, he was forced to withdraw from the squad because of a back injury. 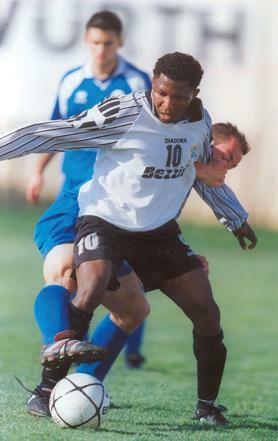 Chukunyere’s performances in season 2001-02 helped Hibs to win the national championship. His dramatic goal against Shelbourne in the Champions Cup the following season secured him a place in Maltese football’s Hall of Fame. His best years, however, were still ahead of him and in the next four seasons his magical feet delighted not only the Hibs supporters but also all those who frequented the stadium. In 2001, Chukunyere was named by the BBC as one of the most prolific African scorer playing in a European league in that particular year. The following season he was voted best foreigner at the Malta Football Awards and was capped by Nigeria in a friendly against Egypt in Lagos. Chukunyere stayed with Hibernians until the end of the 2004-05 season when he decided to make a change and sign for Valletta. However, he played only five league games for the Citizens before he returned to the Paolites at the end of the season. Now a Maltese citizen, Chukunyere is currently a member of the Hibernians coaching staff.